“An alert, handsome dark foreign looking young fellow with a marked London accent” | Come Here To Me! This is how Charles Saurin (Irish Volunteer 1914 – 16 and Officer IRA 1917-21) described an individual called ‘Neale’, an English socialist who was stationed with Saurin in the Hotel Metropole during Easter Week. 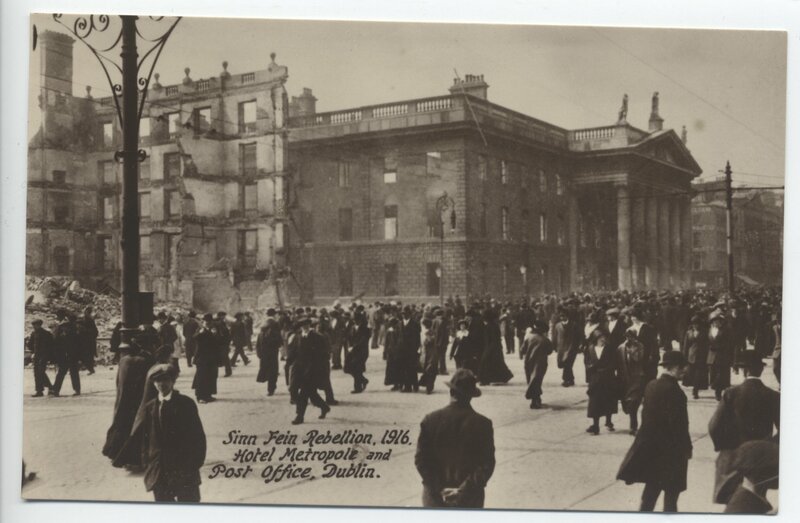 Neale, who saw action in Fairview on Easter Monday and the Vitriol Works on Tuesday, was to be fatally wounded on the Thursday during the evacuation of the GPO. However, you won’t find his name on many of the Easter Week rolls of honour and you certainly won’t find any plaques dedicated to him in the city. The Hotel Metropole after the Rising. For approximately two years I’ve been trying to research the life of this character who I think grew up in Norwich nd was involved in a hotel strike in London in 1913. I believe that his real name was Arthur Wicks and that he was known to by his comrades as Neal/Neale. The many variations of his name and the fact that he was commonly known by a nickname has been a considerable obstacle in trying to research his early life. By this stage, I’ve completely exhausted all secondary sources. I’ve managed to collate a lot of information on his movements in Easter Week and a little bit on his early life. My next objectives are to cross reference the 1916 Witness Statements for references of Neale, try to access British state archives to see if he was under any sort of surveillience during his trade union activity in London in 1913 and go through the English left publications of the period to see if there were any mentions of him during his time in London or to mark his death in 1916. With study, work and everything else it’s been hard to find time to research the life of this elusive individual, let’s just hope I’ll have something written by 2016. Hi, Is there any update on this? Or any more info. Was fortunate enough to do an interesting tour of the city on Saturday and was looking for more information. James, were you on the 1916 tour? If so, I really enjoyed giving it and just wish we had longer! Moore Street and Moore Lane. Hi Donal, Thanks a million for the info. I was indeed on that tour. It was fascinating. Thanks for the list – actually trying to do some digging on the Norwich man. Thanks again for taking the time out with the tour. Hello, any more information on John Neale please? The forthcoming issue of Saothar will have an article on Arthur Wicks (aka John Neal). Thanks for the comment.